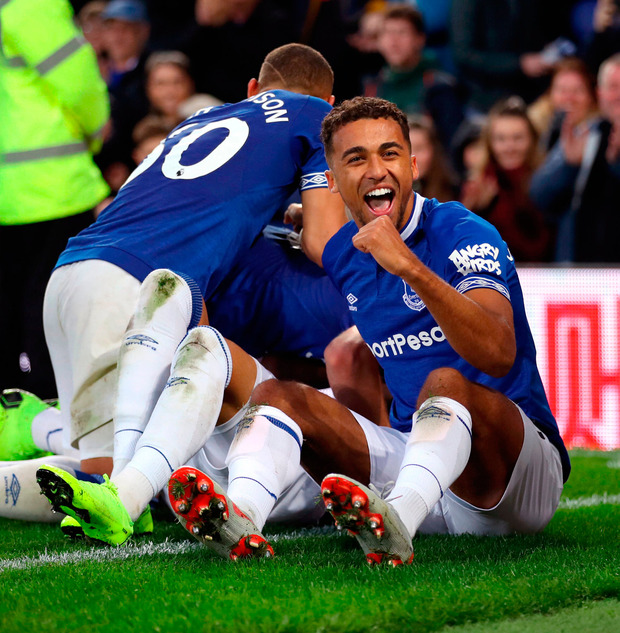 Late goals by substitutes Dominic Calvert-Lewin and Cenk Tosun beat Crystal Palace 2-0 to secure Everton's third successive Premier League victory. Calvert-Lewin headed in from an Ademola Lookman delivery in the 87th minute, five minutes after both players had come off the bench. Tosun, who had come on midway through the second half, then added an 89th-minute strike. Toffees and England goalkeeper Jordan Pickford had earlier kept the Goodison score at 0-0 by saving a Luka Milivojevic penalty on the hour mark. Palace, who have scored only five goals in nine league matches this term, went close in the first half when Cheikhou Kouyate's header hit the bar. Everton, having built on wins over Fulham and Leicester, are now up to eighth in the table, while Palace have dropped a place to 15th after their third consecutive defeat. The first real attempt on goal came in the 10th minute when fit-again Seamus Coleman, back in action after missing Everton's previous four league games, collected the ball from Bernard and fired over from the edge of the box. The hosts then survived a scare as Kurt Zouma and Michael Keane got in a mix-up near their own goal and Andros Townsend looked to take advantage by pouncing on the loose ball before Coleman cleared. Eight minutes later the Ireland international's cutback was met by Gylfi Sigurdsson, whose shot brought a good save out of Wayne Hennessey at the near post. Palace started to show more threat and after James Tomkins headed a Townsend cross wide and Pickford turned behind Milivojevic's free-kick, Kouyate saw his headed effort come back off the bar. Everton then pressed with Richarlison heading over from a corner and Sigurdsson sending a left-footed attempt wide. Palace were handed a golden opportunity to break the deadlock shortly after the break when Coleman brought down Wilfried Zaha in the area and referee Anthony Taylor pointed to the spot. But Milivojevic's strike from 12 yards was kept out by the diving Pickford's right foot. Then Everton had a great chance but Theo Walcott's shot was kept out by Hennessey's feet. Toffees boss Marco Silva brought on Tosun for Bernard, and after debutant Andre Gomes curled an attempt wide, Calvert-Lewin and Lookman were also introduced. All three subs made their mark in a dramatic finale as Calvert-Lewin converted from Lookman's cross before Tosun latched on to a long ball forward from Keane and drilled a low shot in.